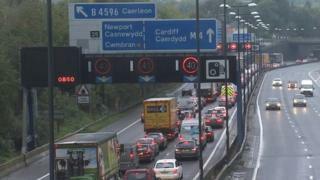 A planned M4 relief road around Newport would cost "nowhere near" £1bn, First Minister Carwyn Jones has said. He said the cost would be "way below that", but he could not put a figure on it, saying the work would go out to tender to get the best deal. Previous plans for an M4 relief road were scrapped in 2009, when Welsh ministers said the costs had risen to £1bn which they judged "unaffordable". Mr Jones told BBC Radio Wales "we want to get it built". According to project details on the Welsh government website which were last updated in July, the estimated cost of the relief road remains around £1bn. Speaking on the Jason Mohammad programme on Thursday, he said: "There's got to be an environmental assessment and there's probably going to be a public inquiry - now we've got to go through that process. "Once that's done, we'll get cracking with it." Plaid Cymru favours an alternative, cheaper plan to relieve M4 congestion, rather than the so-called black route Welsh ministers propose. Plaid transport spokesman Rhun ap Iorwerth said: "Not only do I think it would be £1bn, the black route, it would likely be way over that because this kind of project always leads to overspend." Mr Jones also defended his sacking of a Labour AM from a key post for criticising the Welsh government for spending £20m preparing for the road. Jenny Rathbone was removed as chair of the committee overseeing EU spending in Wales. Mr Jones said: "It's the same as if you're a cabinet minister - you can't attack your colleagues in public. "That's the simple rule of any cabinet anywhere in the world." Are the terms of the debate on the M4 relief road changing? The choice has been framed in a £1bn new motorway, also known as the black route, to the south of Newport versus an upgrading of the southern distributor road, or the blue route, at around a third of the cost, or substantially cheaper at least. Now, according to the first minister, that price difference is shrinking. He has already referred to the blue route as costing between £600m to £800m, and now the black route is coming in much cheaper than originally thought. The first minister has not said on what basis he has come to this conclusion, other than he won't give a specific figure because he doesn't want to show his hand to potential contractors. What is puzzling is the Welsh government website has put the cost at around £1bn in its summary of the project, which names the engineering consultants Arup and Atkins. In the meantime, preparatory work continues for a new motorway, even though no final decision has been made. Last week, Economy Minister Edwina Hart told AMs 160 people are working on the project.